Along with celebrating the accomplishments of the women of the Veteran Feminists of American and the entire Second Wave of American Feminism, we have excelled at collecting and publishing biographies. Our mission includes preserving our history and our crown jewel is the unparalleled, Feminists Who Changed America, edited by Vice President of Development, Barbara Love. Many women and a few men, did not meet either the timeline or know of it until it was too late. And so began these long-form essays, Our Fabulous Feminists. Many of them are autobiographies, all collected and organized by the VFA Founder, Jacqui Ceballos. Many were edited by the wonderful Joan Michel. They were posted monthly and eventually collated into an ebook, Our Fabulous Feminists which is available for free. Our collection continues. You will find the biographies submitted after March 1, 2017 here. 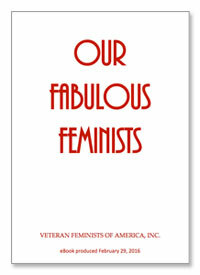 Biographies of VFA Fabulous Feminists. Click on button to the right to download the PDF eBook, Our Fabulous Feminists.